Herbert Mayr, double bass. Born in Wels, Herbert Mayr graduated from Linz music grammar school. He then went on to study double bass at the University of Music and Performing Arts Vienna as well as musicology at the University of Vienna. In 1986 he graduated with a distinction and furthermore received the special prize of the Ministry of Science and Research. A master class at the Academia Chigiana in Siena under the instruction of Franco Petracchi followed. Among other assignments Herbert has performed as part of the ORF Symphony Orchestra, the Chamber Orchestra of Europe, the Vienna Symphony Orchestra and the Bavarian State Orchestra Munich. Since 1989 he is a double bass soloist at the orchestra of the Vienna State Opera/the Vienna Philharmonic Orchestra. Herbert has extensive experience as a chamber musician and as a soloist. He performed with all ensembles consisting of members of the Vienna Philharmonics and the Vienna Chamber Ensemble as well as with other renowned ensembles and musicians from all over the world such as the Artis Quartet, the Vienna String Sextet and Elisabeth Leonskaja. He furthermore has worked with Julia Stemberger, August Schmölzer, Michael Heltau, Wolfgang Muthspiel, Christian Muthspiel and Christoph Widauer. 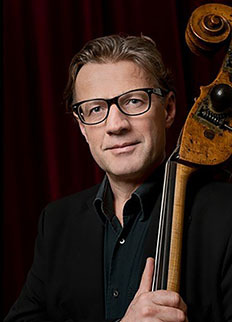 Herbert is a founding member of the ensemble Bass Instinct with Peter Herbert, Gina Schwarz, Timothy Dunin, Gerhard Muthspiel and Ernst Weissensteiner. Herbert has not only worked as associate lecturer at the University of Music and Performing Arts Vienna, he has also given numerous guest lectures at home and abroad, such as at the Trinity College London, the Escuela Superior de Reina Sofia in Madrid, the University Alcala de Henares (Spain), the University of Canberra (Australia) and the Pacific Music Festival Sapporo (Japan).